IQF Foods Pvt Ltd. maintains a state of the art unit that can do both individual quick freezing (IQF) with an output capacity of 4 MT/ Hr. as well as blast freezing of fruits and vegetables. The factory has its own onsite Cold Storage Rooms with a 300 MT capacity maintained constantly at -18° C. For larger orders the company partners with reputed cold stores in its vicinity to store larger volumes of products to meet customer time/shipping schedules. 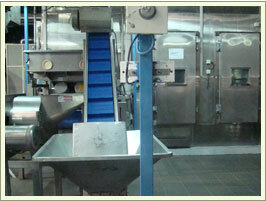 IQF Foods Pvt Ltd. is a HACCP certified company. 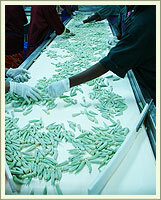 Food safety and quality is given top priority in the plant. The factory has a dedicated laboratory where physical, chemical and microbiological characteristics of the product are consistently monitored. In addition, the raw materials entering the factory are inspected upon arrival to ensure compliance with the written specifications laid down by the company. Strict sanitization and cleaning schedules are maintained and strictly adhered to at all times throughout the plant to ensure cleanliness of plant and equipment. This, coupled with high standards of personal hygiene and cleanliness of personnel, minimizes the risk of product contamination. 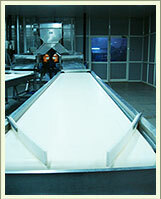 At IQF Foods Private Ltd. our customers are of the utmost importance. Our mission, therefore, is to provide our customers with safe, high quality products processed within hours of harvest to maintain their ‘just picked’ freshness, at highly competitive rates. The company also strictly adheres to the delivery schedule of the customers. New product development, to cater to customer demands, is a constant endeavor. Copyright © 2009 IQF Foods Private Ltd. All rights reserved.